Good food does not need to be complicated. 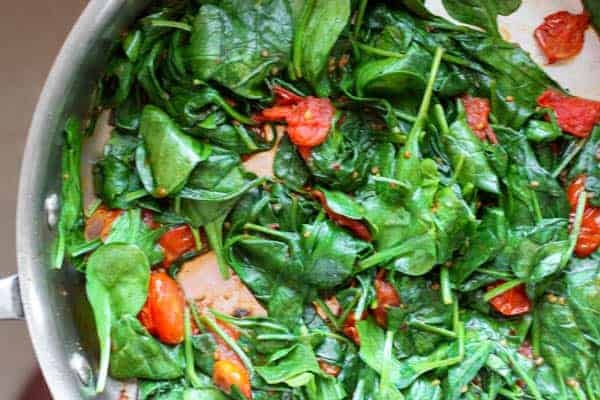 Tomato Spinach Saute is an easy recipe with healthy dividends. This vegetarian recipe is ready in 15 minutes. 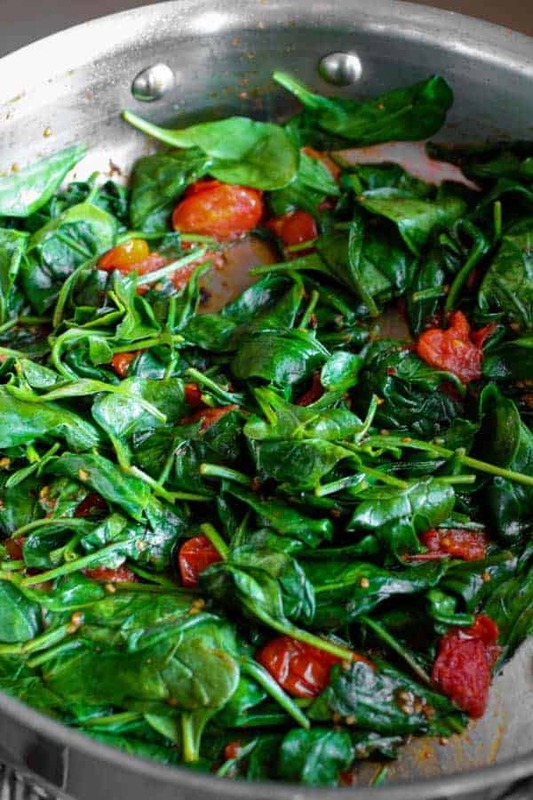 However you want to say it, Tomato Spinach Sauté is all that and more! We all know vegetables are good for us. But emerging research suggests that eating more fruits and vegetables improves happiness, satisfaction, and emotional well-being. People who ate fruits and vegetables 6 to 7 times in a week reported greater life satisfaction than those who ate fewer. They reported feeling better about themselves, feeling confident that are maintaining their health, and having more energy. No chance of 6 servings for you? Try for one more serving than you currently eat. It may be that your key to happiness is in reaching for an orange or a tomato. Packed with lutein, folate, potassium, iron and vitamins A, C, E and K, spinach is a leafy green to choose often. Going with this green strengthens our cells against cancer, heart disease, high blood pressure, and bone loss plus enhances vision. So, let’s get to cooking! 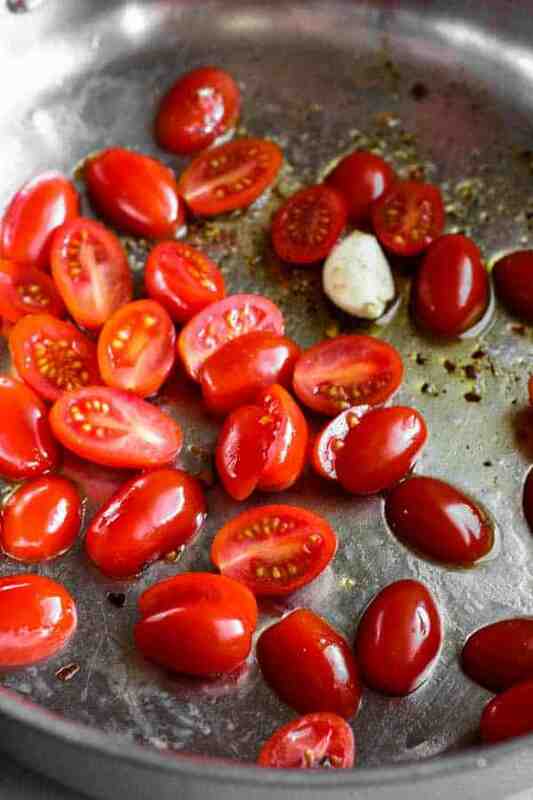 Slice the tomatoes to reduce cooking time and release juices. Red chile flakes and a smashed garlic clove add seasoning. 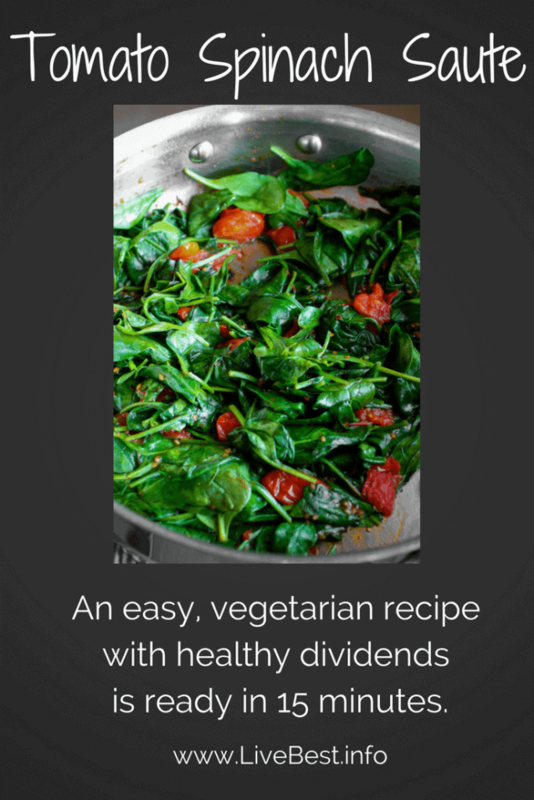 Stir in fresh spinach and you’re serving, from one pan, in less than 15 minutes. Place the clove on the cutting board. Lay the flat part of a knife blade (sharp edge away from you) on top on the clove, then hit the knife with the heel of your hand. I use a Chef’s knife because of the wide blade. This releases the compounds that give garlic its pungent flavor and healthful benefits. Let the clove rest for 10 minutes before cooking, to allow those compounds to work and you maximize the healthy benefits. With a few more fruits and vegetables you will feel better now and in the future. Satisfaction guaranteed when you feed your body what it needs. As our thoughts turn toward Valentine’s Day, a serving of healthy food is a good way to say “I love you.” This recipe is a winner at that. 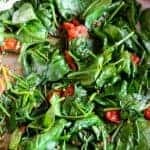 More LiveBest recipes with tomatoes or spinach. Smash the garlic clove (allow to rest 10 minutes). Pour olive oil in a large skillet over medium heat. Add garlic clove, salt, pepper, chile flakes and tomatoes. Cook until tomatoes are soft, about 10 minutes. Add spinach and lemon juice, stir until wilted, scraping up the browned bits in the bottom of the pan, about 3 minutes. Serve. Cook the spinach about 75%, until some are wilted and others still have some structure.